Lynn Crawford is arguably one of the most recognizable Canadian chefs on network TV. Not only is she is a local icon, consulting for shows like Marylin Denis and starring in shows like Pitchin’ In and Restaurant Makeover, she has become a household name across the border by tackling Bobby Flay on Iron Chef America and recently competing on Top Chef Masters. I’ll also argue she is a sorceress. I had the opportunity to meet her and chef Lora Kirk at a food truck fund raiser a while back. At this point I had been to Ruby Eats, her retail outlet featuring pickles, jams, specialty foods and take out lunches. On the other hand, I hadn’t yet ventured to Ruby Watchco, her single menu, set price family style venue a few doors down on Queen East. I’d had intentions and I’m not fussy in general (other than tomatoes, olives, goat cheese and lamb) but the latter seemed to the be main course every time I had the chance to go. Finally, the stars aligned. I was in town, loved the look of the menu, called and was greeting by a pleasant voice who booked me a “half eight” reservation (I think old school UK accents are so cool…I suddenly had Ruby Tuesday by the Stones in my head..after all it was a Tuesday and I was going to Ruby). After verifying with my translator, I confirmed that this indeed meant 830 and I was good to go. The decor is a mix of modern and rustic. It’s long and narrow, with a large bar on the left and a semi-open kitchen in the back. Laura was front and centre and Lynn was buzzing around in the background. The waitstaff were dressed with a professionalism Charles the Butler would approve of. Here’s where the sorcery comes in. Looking at the menu, you think you’re going to get off easy. I mean, $49 for a 4 course meal orchestrated by one of Canada’s most recognizable chefs seems like a steal. What you’re not told is the series of temptations that await once you are seated. 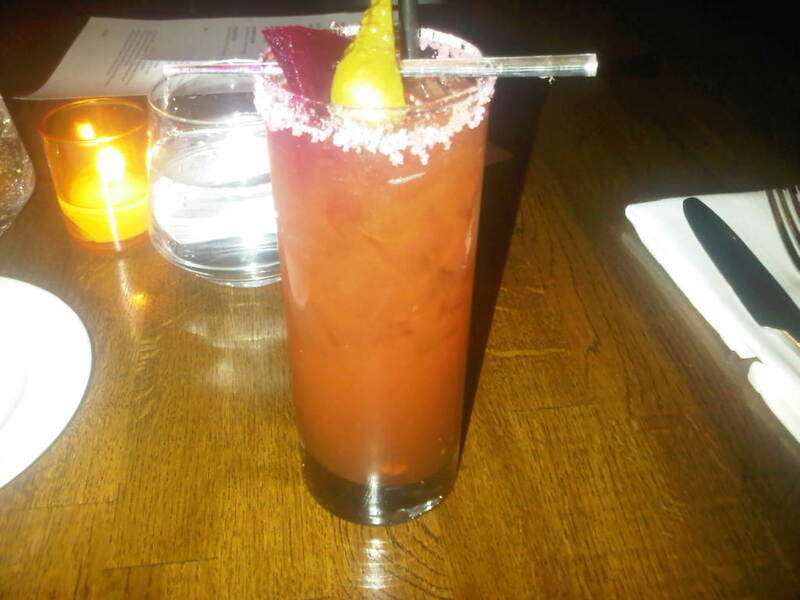 Take for example, the Red Derby, Ruby’s spin on the Caesar. I was warned by a friend who was there the week before that the Caesar was addictive. It looked innocent enough, served without the bells and whistles such a side of charcuteire or a lobster tail. It was a straight up Caesar served with Charlie’s pickles (of which I have purchased a few jars in the past and thoroughly enjoyed at home) which hit all the elements of the classic Canadian cocktail. At $14 a pop, I gave in and had a couple over the course of the meal. The evening’s menu started with “Barrie Hills Farms’ Watermelon Salad”. 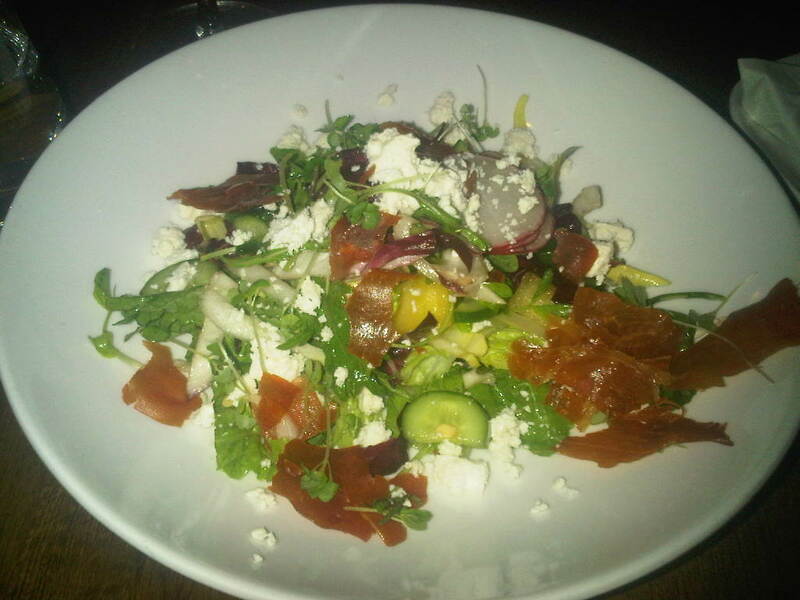 It was a slew of everything from feta to prosciutto to radish. The watermelon was not as abundant as i predicted but added enough sweet to balance the diversity of salty and bitter flavours which were abundant in the other ingredients. The dressing was delicate and catalyzed instead of drowning the salad’s fresh ingredients. Temptation two from Lynn’s bag of tricks was Lora’s lobster BLT. $16 gets you half a sandwich served with cocktail sauce. Using my primary math skills means a whole sandwich would equate to $32, but it’s lobster! and worth it. It’s one of the better things I’ve eaten this year. 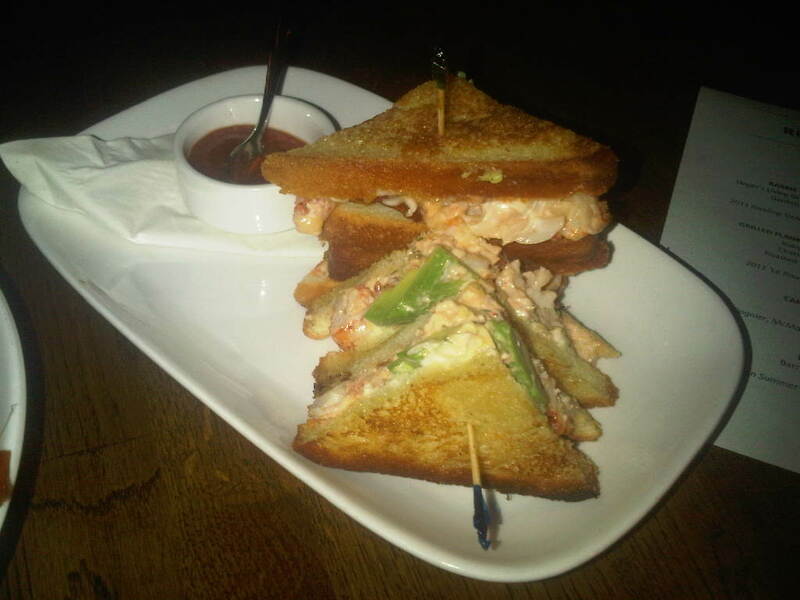 The bread stayed crisp despite housing a concoction of chunky lobster meat and avocado. The debate was the use of the cocktail sauce. In one sense I didn’t want to mask the flavour of the lobster. On the other hand, the tangyness was a great compliment to the sweet sandwich filling. 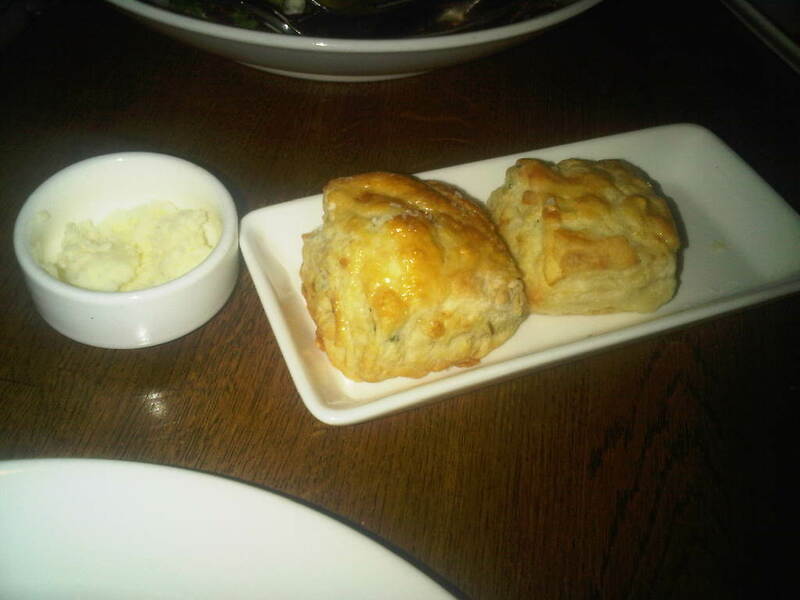 The cheddar biscuits were a nice addition to the meal. Nothing speaks to family dinners like the smell of freshly baked biscuits and Ruby’s were fluffy and delicious. 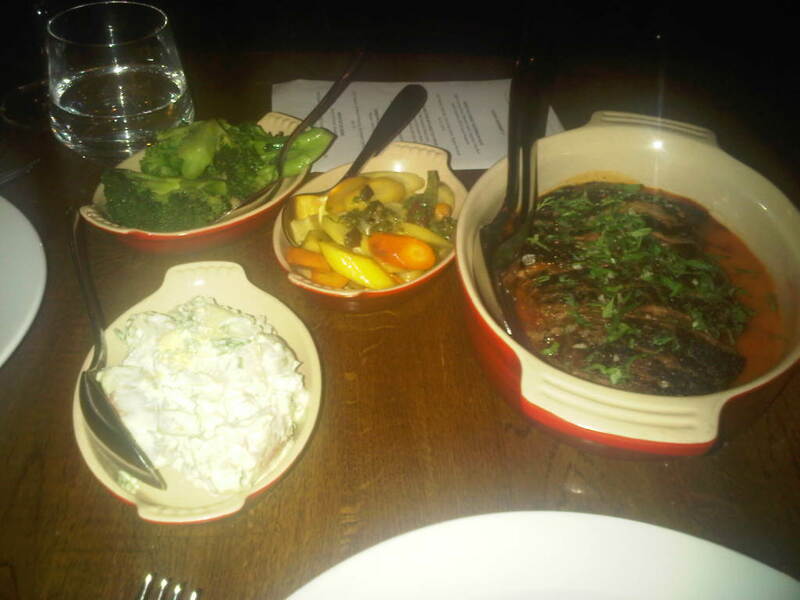 With the main course , my head was filled with memories of old family dinners which featured overcooked pot roast, lumpy potatoes, soggy greens and carrots which disintegrate with the touch of the fork. Ruby’s, on the other hand, redefined the meal with an offering of grilled flank steak with sweet hot pepper sauce served with potato salad, charred broccoli and roasted heirloom carrots. Each component was well executed, the sauces were delicious and the portions were a good size. Sure, the broccoli could have used a little more char and the carrots an extra minute cooking, but it was a rewarding meal that didn’t need to be salvaged by a ladle full of trio gravy. Damn you goat cheese! I loathe you so! Despite the beautiful presentation, I couldn’t finish it. I could have easily eaten a bowl of the honey and peaches though. I asked my colleague his thoughts; he enjoyed the cheese and would have even liked more of the peach/honey mix. 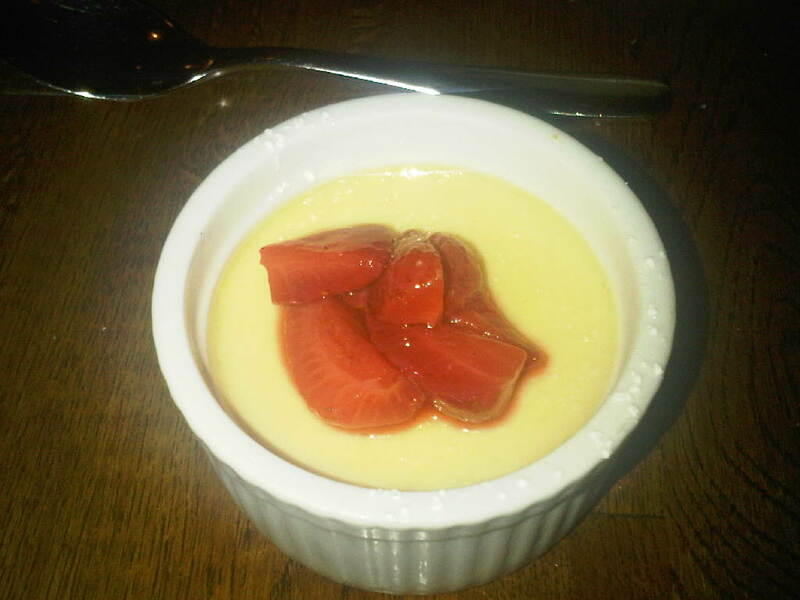 Dessert was a maple pot de creme topped with strawberries. 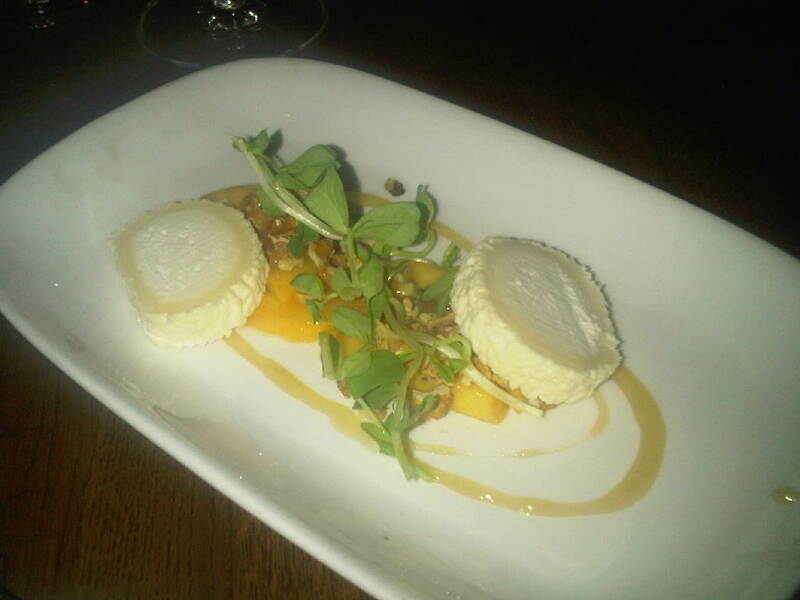 My biggest problem was the portion size (it was probably adequate but the dessert was so good it just wasn’t enough). I could have eaten three of them. My colleague suggested a sprinkle of salt (or bacon) may have been a nice touch although I think Lynn would have something to say about that. Once again, I succumbed to the wizardly of Lynn and ordered an Americano afterwards. It wasn’t very good and I was charged $5 (which is one the highest prices I’ve paid for one). It was a bit of a bitter end to the night (primarily because coffee is bitter I suppose). Lynn Crawford’s Ruby Watchco employs a concept few chefs could get away with…one menu at one price (but in the words of Mick Jagger.. “Who could hang a name on you? When you change with every new day.”…damn that song is still in my head). The nightly menu is generally traditional (brick chicken, fish on Fridays etc…) and may not appeal to everybody on a daily basis, especially those looking for pulled pork tacos or a bowl of ramen. I will admit the single menu choice has kept me away a few times. Once there, however, you are thrown into an environment which combines the modernism of Toronto eateries with the tradition of a sit down Sunday dinner (although they are closed on Sundays). Once again, Lynn Crawford is a sorceress. Her promise of a $49 dinner gets clouded by a spell of choice cocktails and seductive sandwiches. The next thing you know. the bill inflates to triple digits but you can’t help but leave feeling pretty satisfied. In addition, you can avoid the pitfalls of a family dinner: there is no need to pretend like your annoying niece is cute or that you care about the cyst on your Aunt’s cat Fluffy’s paw. Ya, it costs a bit more but maybe I can offer to pitch in and shuck some oysters or pick some peaches for a few bucks off.